Provide your employees with 24/7 online access to benefits information. Who likes the stress of managing enrollment with paper forms? Surprisingly, that's how many companies still do it. With Enrollment Services you can gain comprehensive electronic enrollment support and eliminate paper forms! 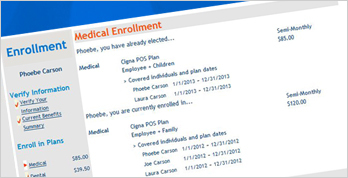 All of your benefits enrollment processes will become quicker and more manageable through an easy-to-use online system. Enrollment Services is integrated with the EbixBenergy Communications platform, so there is only one destination for education and enrollment with a single login. With the open email enrollment messages feature, you can quickly and easily send customized email enrollment reminders for Open Enrollment, Life Events, and Year-Round Enrollment. Administrators also have the flexibility to send emails to employees within specific departments or at specific locations, as well as to work or personal email addresses. With information about benefits plans available within EbixBenergy, decision making becomes simple. As employees prepare to make benefits choices, they will have 24/7 access to side-by-side plan comparisons, plan video tours, life event checklists, online calculators, and other decision support tools, allowing employees to make the best decisions for themselves and their families. Enrollment Service’s intuitive selection screens help employees review and update personal and dependent data before they make each benefit selection. The eligibility rules and logic configured into the system eliminate mistakes that often plague the paper enrollment process. When finished, employees can view and print a confirmation statement. Employee benefits enrollment administration is information intensive. Administrators need reports to track employee status in company benefit plans, premium changes, and important benefits related events. Creating reports often involves spending a lot of time compiling data from different sources or spending money to develop custom reports. Ebix Health is a leading provider of consumer health information and benefits management solutions for some of the world’s largest insurance carriers, third party administrators (TPAs), self-administered organizations, benefits brokers, employers, health care organizations, and educational institutions.